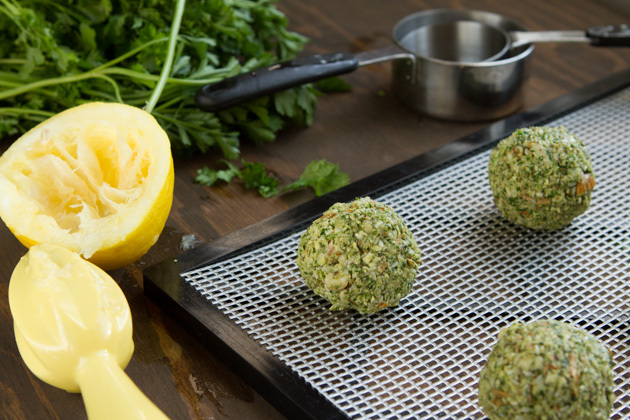 Ground nuts, seeds and fresh herbs make the perfect texture and flavor in these bean-free, low-carb, and keto falafel balls. First, I have to say:: I have nothing against beans! I love them… sometimes. It’s just nice to have options, you know? Or, maybe you’re allergic to beans, avoiding beans, they make you toot and you have a hot date tonight… whatever. Not to fret, my friends. 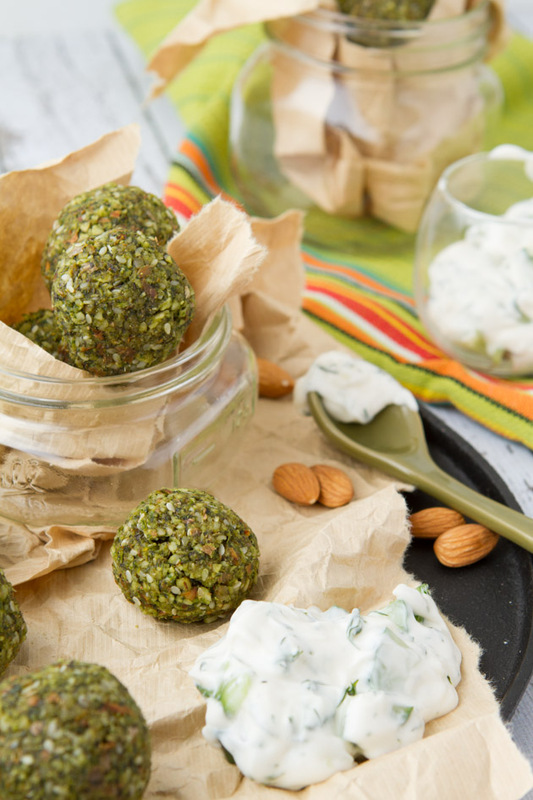 I come to you with bean-free falafel to save the day. Because this recipe is paleo, it’s also dairy-free, gluten-free and grain-free. 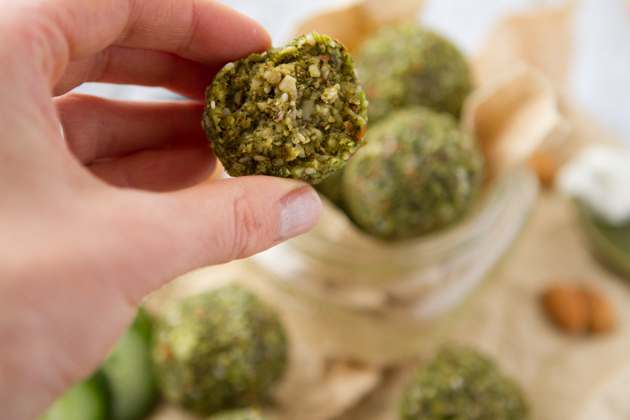 And; because vegans rock just as much as paleo tribes do, I made this recipe vegan, too. 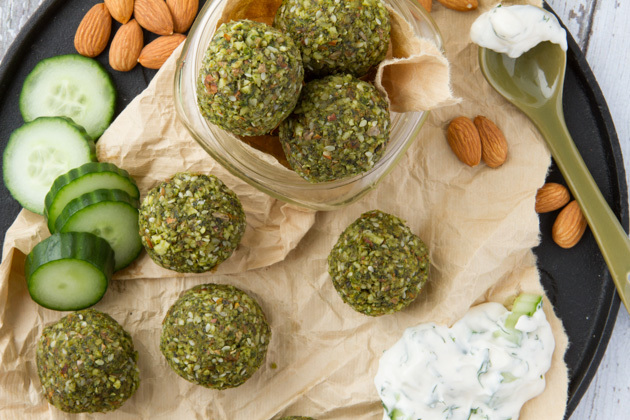 Soaking + pureeing + rolling + dehydrating and voila, you’re snacking on falafel and nuts at the very same time. Don’t have a food dehydrator? I’ve had this 4-tray Excalibur Food Dehydrator for nearly a decade and it’s still going strong. If I were to do it all over again, though, I would spend the extra $60 and get a 9-tray. So many more possibilities. Anyways, if you don’t have a food dehydrator, no worries. You can make this paleo recipe in the oven, too. 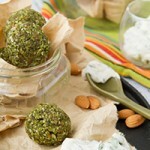 Ground nuts, seeds and fresh herbs make the perfect texture and flavor in these bean-free falafel balls. 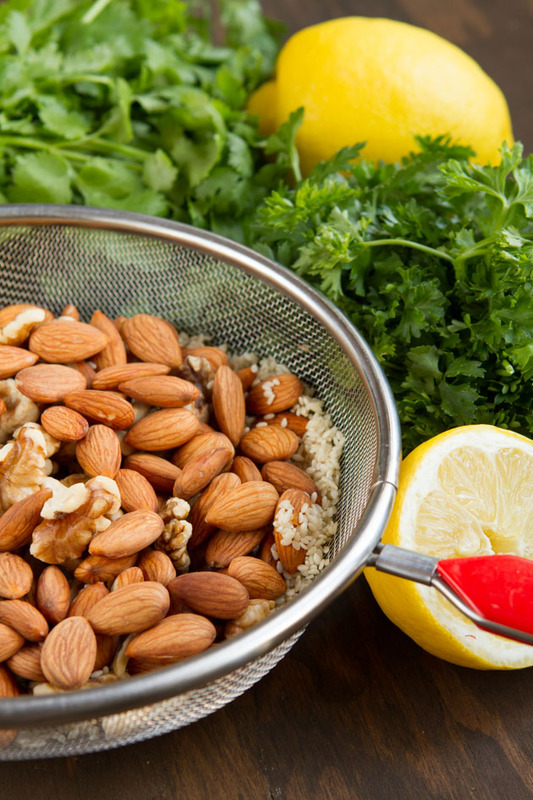 Add walnuts, almonds and sesame seeds to a large glass bowl. Fill with water, cover and refrigerate for 12 hours. Once complete, strain and rinse. 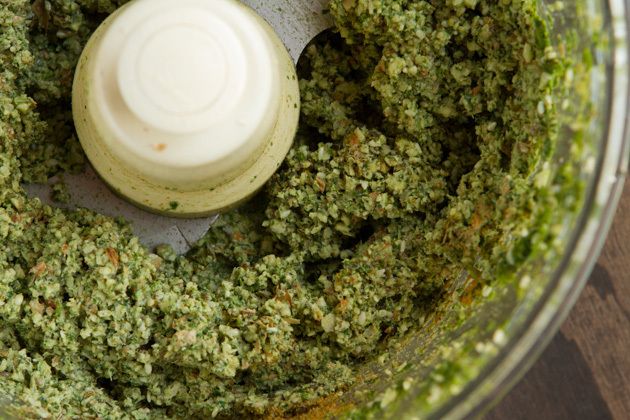 Add cilantro, parsley, olive oil, lemon juice, mint leaves, cumin, nutritional yeast, oregano, garlic, cayenne pepper, salt and ground pepper to the bowl of your food processor. Then add soaked nut and seed mixture. Pulse mixture until nuts are the size of sesame seeds. Roll the dough; 2 tablespoons at a time, into balls. Press and rotate as you go to allow the mixture to stick. Repeat with remaining dough, creating 16 balls in total. Place completed balls on food dehydrator racks. Dehydrate at 110F for 10 hours, rotating halfway through. If you do not have a dehydrator, recipe can be cooked at the lowest temperature your oven will go (180F) for 3 hours, rotating halfway through. Nut allergy - if you are allergic to nuts, you could make this recipe with 1 cup of sunflower seeds and 1 cup of pumpkin seeds. Sesame allergy - if you are allergic to sesame, you could replace the sesame seeds with an equal amount of hemp seeds. Do not soak the hemp seeds. Food Dehydrator - if you do not have a food dehydrator, I have included oven instructions in the recipe. 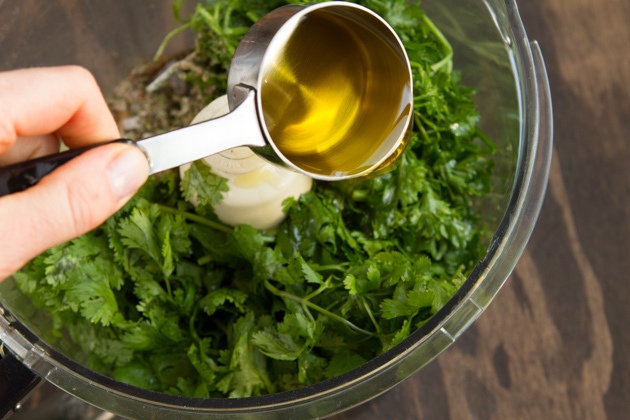 First, you want to make the herb mixture really smooth. This is the component of the recipe that holds everything together! 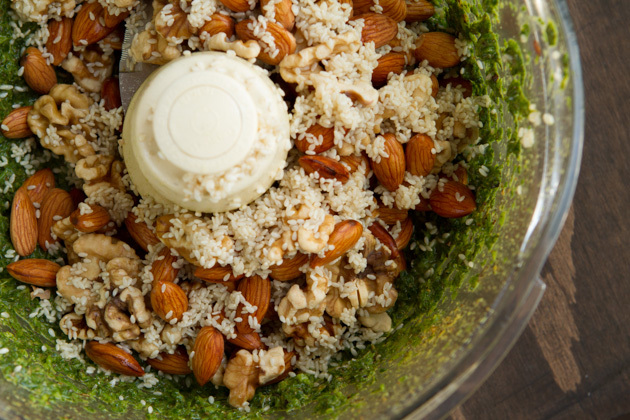 Once it’s smooth, add the nut & seed mixture to the bowl of your food processor. I have had this 14-cup Cuisinart Food Processor for a little over 3 years and enjoy it. Although my $40 Black & Decker did a comparable job – it died when I tried to make nut butter for the first time but could ace a paleo recipe like this one! You see the consistency below? This is what you’re aiming for. The almonds and walnuts are about the size of sesame seeds. 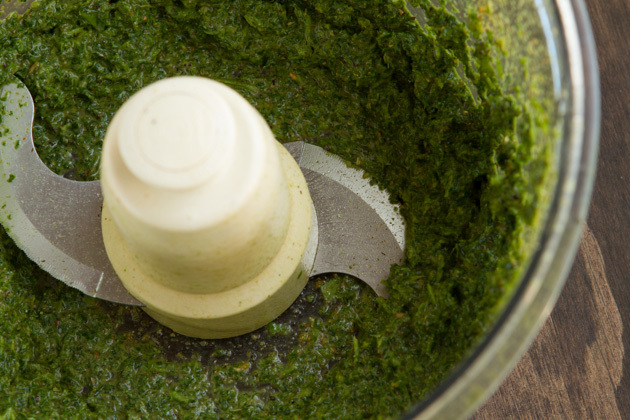 You do not want to blend the mixture until it’s smooth… or it won’t taste like falafel. Roll em up, dehydrate (or bake as per instructions in the recipe) and serve on their own, or with a quick and easy sauce. The sauce I made for the pictures of this recipe was a combination of:: tahini, homemade yogurt, lemon juice, garlic, water and minced garlic. 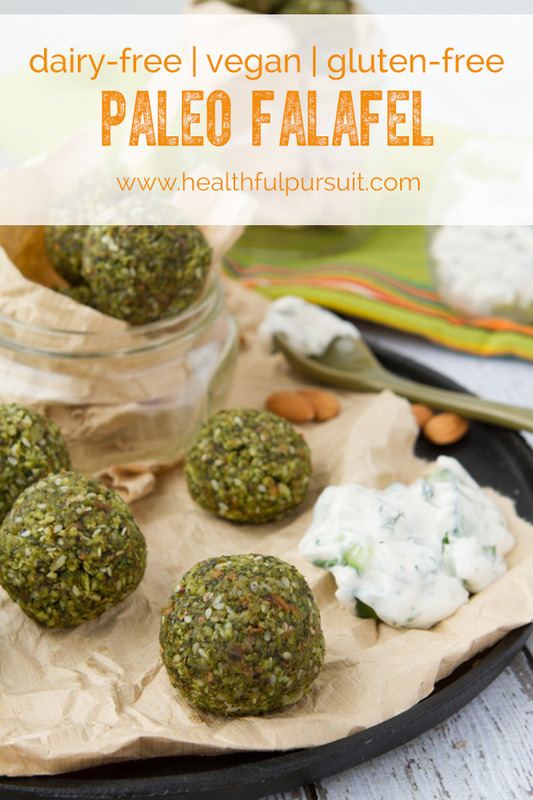 These paleo falafel are great on top of roasted veggies, as a snack, or crumbled over a salad.